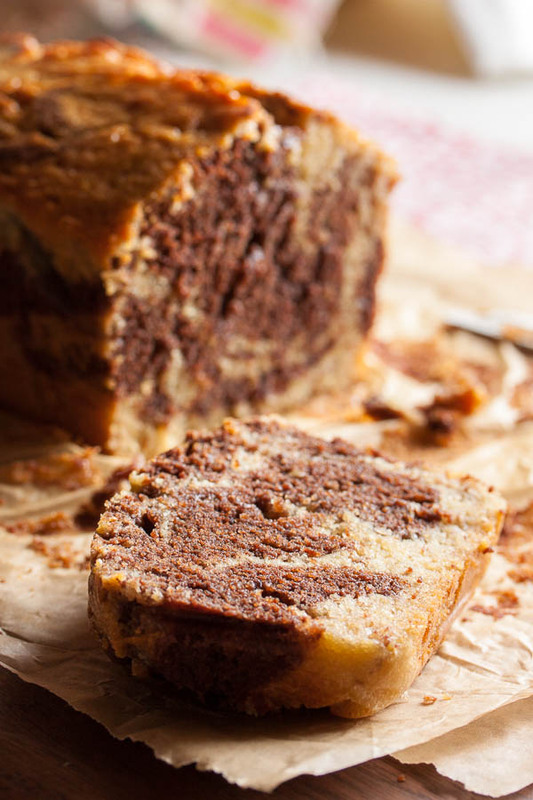 Chocolate Marble Banana Bread | wanna come with? During the summer, I love having a fruit smoothie every day for breakfast. It’s so cool and refreshing, and to be honest it’s about the only time I get fruit in my diet (I’m not a big fan – sorry, I’d much rather have vegetables). I don’t always have the same combination of fruits and juices, but they all start with a base of frozen bananas – that’s how you get that great thick milkshake-y texture. But sometimes my kitchen gets a bit… messy. Cluttered. I usually have baking ingredients all over the place, and if I’m going to be using my cookie sheets again right away, I won’t bother putting them away. And sometimes the bananas get… misplaced. Forgotten. When this happens, I usually don’t find them until they’re ripened beyond belief. But that’s just fine. It just means that instead of being used in a smoothie, they’ll get used in some baking. Trust me, I’m never truly upset by this development. Not in the least. If you’re not ready to use them right away, bananas freeze beautifully. Just peel them, break them into smaller chunks, and pop them in a freezer bag. Some people will say to freeze them on a baking sheet first and then transfer them to a container, but I just don’t have that kind of room in my freezer. I barely have room for the freezer bag. So they may clump together a bit, but they’re easy enough to break apart. 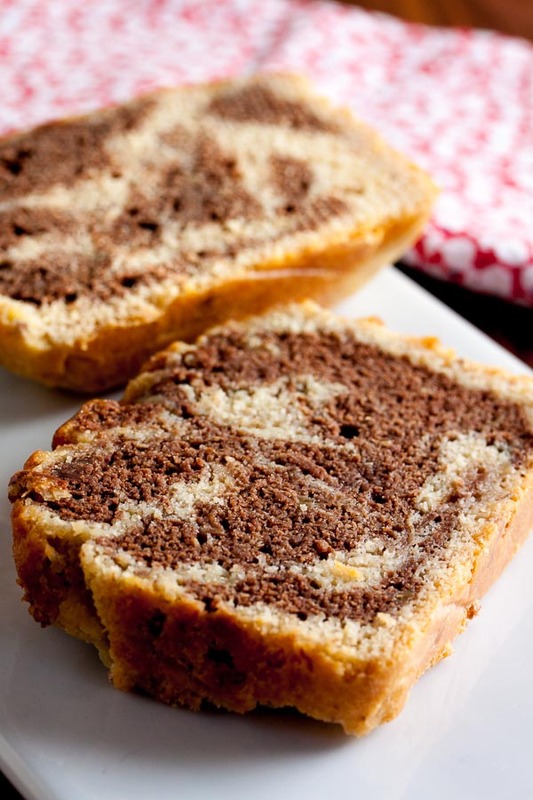 I’ve got a lot of recipes for banana bread and banana bundt cake (so good!) 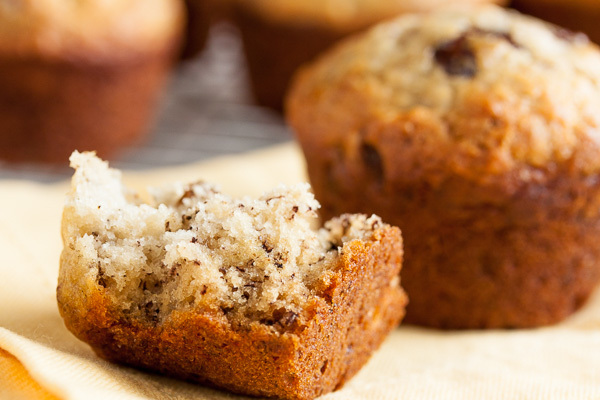 and banana muffins (I still have some banana left in the freezer, so I may be revisiting this shortly). I knew exactly what I wanted to make this week, though. Banana bread. With chocolate. And rum. Oh yeah. 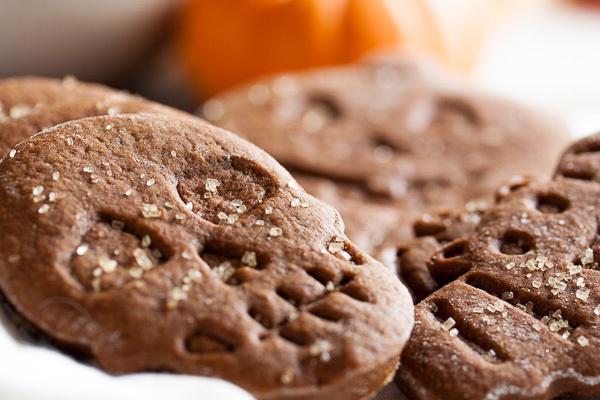 It’s a perfect cold weather treat. 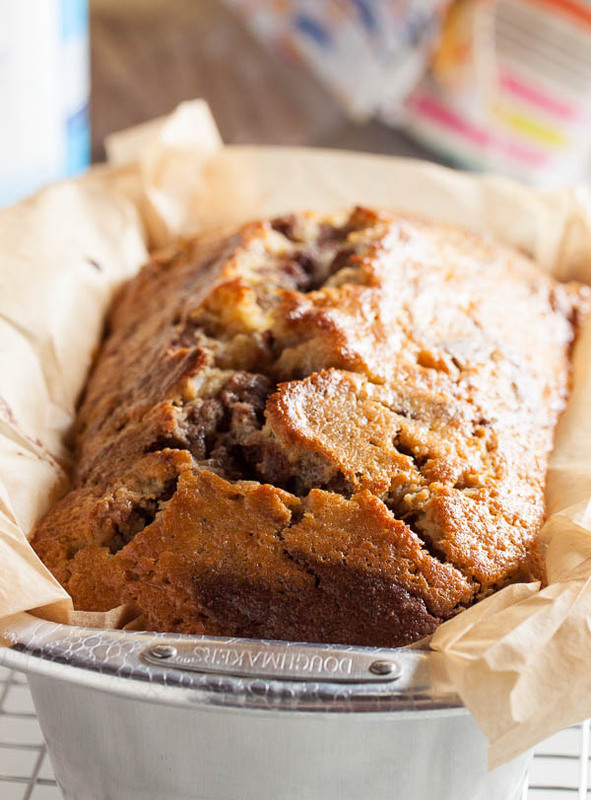 Oh who am I kidding – this banana bread is perfect year-round. And look at that lovely cracked top. I know not everyone likes that cracking that often occurs on the top of a pound cake or loaf cake (apparently a result of steam escaping while the sides bake faster than the middle), but I think it’s beautiful. Adapted from Dorie Greenspan's "Black-and-White Banana Loaf" from Baking: From My Home to Yours. Makes one loaf. Line an 8-1/2" loaf pan with parchment paper, or butter and dust with flour. 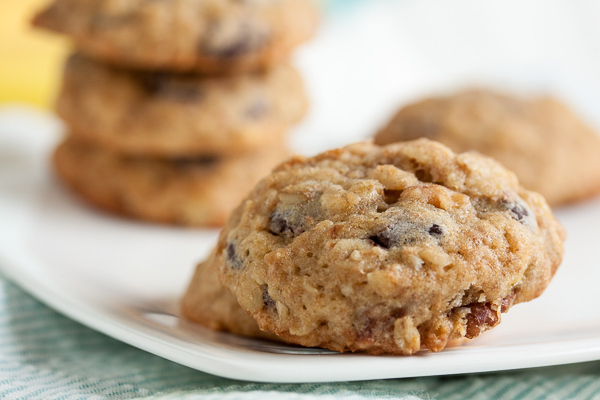 In a medium bowl, whisk together the flour, baking powder, salt, and nutmeg. Set aside. 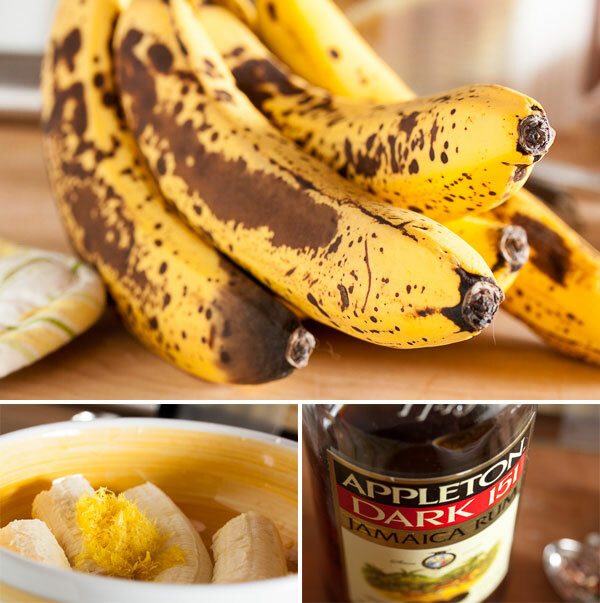 In a small bowl, mash together the bananas, lemon juice, lemon zest, and rum. Set aside. In a small saucepan over low heat, or in the top of a double-boiler, gently melt together the chocolate and 2 tablespoons of butter. Set aside and allow to cool. In the bowl of a stand mixer fitted with the paddle attachment, beat the 1/2 cup butter and sugars together on medium speed until light and fluffy, about 3 or 4 minutes. Scrape down the sides of the bowl and add the eggs, one at a time, beating well after each. Add the vanilla and beat again to incorporate. Turn the mixer down to low and add half of the dry ingredients, mixing until just barely combined. Then add the milk, then the other half of the dry ingredients, and finally the banana mixture. The batter will look very lumpy, but don't overmix. Transfer a bit less than half of the mixture to another bowl and add the melted chocolate. Stir until smooth. 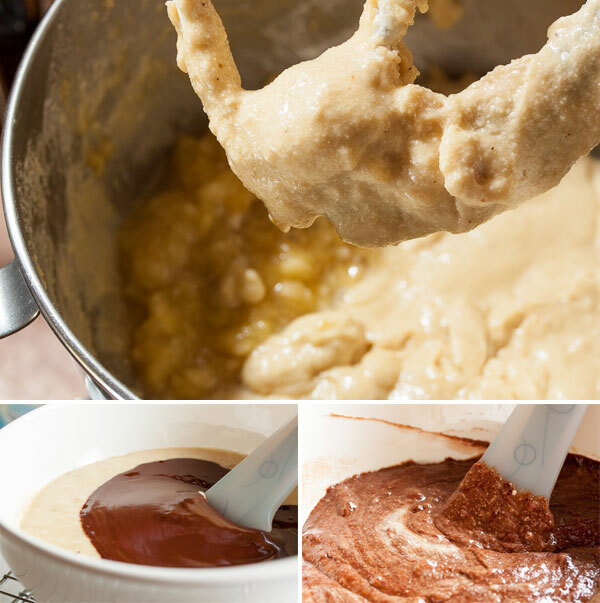 Spoon the batter into your loaf pan, alternating between the plain and chocolate batters. Then, using a butter knife, swirl the two batters together. Bake for about 1 hour and 20 or 30 minutes, until a bamboo skewer or butter knife inserted in the middle comes out clean. Allow to cool on a wire rack for at least 15 minutes before removing the loaf from the pan.